The KA-BAR BK22 Becker Campanion is a tough, multi-role outdoor knife that is equally at home skinning a deer or slicing an onion. Its broad fixed blade has a drop point and a sharp plain edge, allowing it to accomplish a wide range of tasks efficiently. 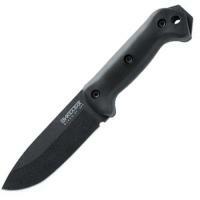 Its black finish protects the steel from wear, perfect for hard use. Its handle is shaped for a secure grip, with a large finger guard and pommel that provide plenty of protection and leverage. It is made from Ultramid, a strong and wear-resistant polyamide. It comes with a sturdy polyester sheath that includes a front accessory pocket and MOLLE-compatible straps for versatile carry.